As large areas of forest are lost throughout the tropics, prime habitat of many species decline and become fragmented. The island of Borneo is a prime example, with accelerated clearing of forests primarily for oil palm expansion. 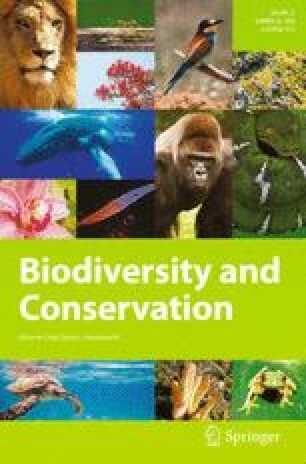 Borneo is recognized as an important stronghold for the conservation of the sun bear (Helarctos malayanus), but it is unclear how habitat reduction and fragmentation is affecting this frugivore. We used camera traps and sign surveys to understand patterns of sun bear habitat use in a matrix of fragmented forests and extensive oil palm development, which has existed as such for > 15 years: the Lower Kinabatangan floodplain in Sabah, Malaysian Borneo. Within these small forest fragments, squeezed between a major river and oil palm plantations, bears exhibited selection for areas farther from human activity (plantations, river boat traffic, and buildings), and were rarely active during the day, demonstrating both spatial and temporal avoidance of potential human-related threats. They selected large trees to feed and rest, and also exploited adjacent plantations to feed on oil palm fruits. We conclude that even relatively small forest fragments (~ 2000 ha) within large agricultural landscapes can be important for sun bears. Our research highlights the remarkable adaptations this species has employed to persist in a drastically modified landscape. The online version of this article ( https://doi.org/10.1007/s10531-018-1619-6) contains supplementary material, which is available to authorized users. We thank the Sabah Biodiversity Centre, Sabah Wildlife Department, and Sabah Forestry Department for permission to conduct this study. For assistance with fieldwork, we thank all staff and students at Danau Girang Field Centre. Funding for this study was provided by International Association for Bear Research and Management, Association of Zoos and Aquariums, Columbus Zoo and Aquarium, Wildlife Reserves Singapore, Hauser Bears and the Bell Museum of Natural History. The camera trapping work was funded by Sime Darby Foundation and Point Defiance Zoo and Aquarium. Funders had no role in study design, data collection, analysis and interpretation, or decision to publish. We thank two anonymous reviewers for helpful comments on an earlier draft.